The book written and reviewed here covers a multitude of subtopics under the main thread of receiving miracles from God. 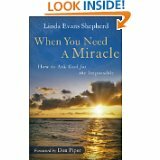 The chapters have such titles as: Need a miracle? The Trust Factor, The Love Factor and many others. Topics cover such things as spiritual warfare, prayer, drawing near to God and praise. Within the chapters Scriptures are noted as well as quoted, at the end of the chapter “Miraculous Prayer” and “Scripture to Ponder.” There are also within each chapter various prayers written by the author that she continues to pray in her time with the Lord. Linda also has a website which she reiterates at the end of the chapters for further aid to the reader. The author writes about being in the Word of God daily and how important it is to the believers’ growth, I highly concur. Linda also shows prayer as another avenue that all believers have to connect with the Lord in any and all situations. She also shares her personal experiences and testimony as well as the stories of others who have experienced God working in their lives. It is apparent to anyone who reads this book the Linda reads from a variety of authors and teachers, which is encouraging in that we can see she never stops reaching to learn. The reader may want to exercise caution when reading this book for a couple reasons. Please don’t look at the book as a way to get from God what you want, it doesn’t happen that way. Second, the prayers in the book might be a place to start but not the end; prayers should be from the heart by the prompting of the Spirit. Also remember that we have the Lord and the Spirit who pray for us always, we aren’t to pray to get but to connect and obey the will of God. Finally, seeking miracles is not the focus of any believer, God is our sole focus. Study His Word in depth till your race is finished, you will grow more than any words can convey. Understand too that to this reviewer us being reconciled and able to have a relationship with a holy God who loves us long before we loved Him, is a miracle in that we could never have done this for ourselves. Let us all seek to love the Lord, seek His face as well as be obedient followers thereby showing Him as well as others our love for Him. My rating of this book is 2 stars.